Since its formation in 1964, the Port of Skamania County has served as an economic catalyst for community development that enhances the livability of the area. The Port is governed by a three-member Board of Commissioners, elected by the citizens in their districts, to serve a six-year term. These three elected officials are responsible for: representing public interests, setting Port policy, determining program direction, setting long and short range goals, approving the annual budget, and evaluating and guiding the Port activities. This planning and oversight process involves the Port Commission, the Port Executive Director, staff, and citizens. Port districts are municipal corporations; however, unlike cities and counties, ports are “special purpose districts.” Public ports have expanded roles in how they conduct business, allowing them to act quickly on opportunities that foster economic growth. The Port of Skamania County takes pride in the community we participate in and the opportunities we work hard to create and maintain. 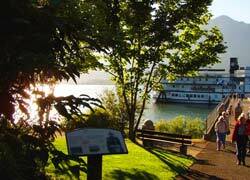 There are a lot of things that make Skamania County an exceptional place to live, work, and play. In addition to learning more about our Port, we invite you to view our webcams to see live video feed of our area. 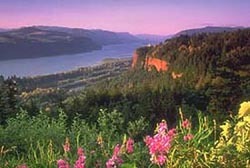 We also recommend taking a glimpse at the weather in the Columbia River Gorge! 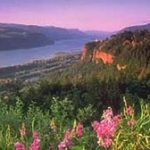 The Port’s Mission is to identify, develop, and promote economic resources that foster diversity, prosperity, and quality of life for all citizens of Skamania County. Improve and operate public parks and recreational facilities and promote tourism. Port District covers much of the southern portion of Skamania County. 14 businesses are located at the Port, employing approximately 220 people. See Our Tenants for more information. The Port owns 162 acres in Stevenson and North Bonneville including approximately 30,000 square feet of commercial space and 120,000 square feet of industrial use space. See Available Properties to see what is available for lease. Public access to recreational opportunities is an important priority for the Port. The Port owns and maintains approximately 6 acres of park land with 1.5 miles of waterfront in Stevenson, and has developed 1.1 miles of walking paths with interpretive signs and amenities. The Stevenson Landing dock, parks, beaches, and boat launch ramp facilities draw a variety of water-sport enthusiasts and tourists helping to invigorate the local economy. Further improvements are proposed within the Comprehensive Scheme of Harbor Improvements. In cooperation with the Skamania County Chamber of Commerce and Economic Development Council, the Port installed a live 24-hour video camera on the roof of the Tichenor Building providing the world with a birds-eye view of the beautiful Columbia River waterfront and Stevenson Landing. Since its formation in 1964, it has been the Port’s goal to encourage economic development and job creation. It is also important to the Port to preserve the high quality of life historically enjoyed by area residents, recognizing that this feature is one of the Port’s strongest marketing assets. The economic vitality of the Port District is integral to its success, as increased employment opportunities, a reduction in unemployment, and increases in real incomes can improve the overall quality of life for the area. In working to achieve its goals, the Port will focus on industrial and commercial development. The Port will induce private investment that will create increased employment opportunities. The Port will also seek capital investments that leverage private investment, strategic job growth, and positive fiscal benefits to Skamania County. The Port is a leader and a team player in local economic development efforts. It will promote growth and development in a responsible, planned manner, always remembering the public’s interests and needs as an integral part of its decision-making process. The Port will promote new business investments that will assist the local economy to become increasingly diverse and non-seasonal, and the Port will seek family-wage job opportunities.